The other day I was leading a tour under a perfect blue sky across some rocks in the recently dried-out borrow ditch onto Lee Cypress Prairie. As we pushed through shoulder-high goldenrod on the far side, a bright green anole inspected us from perch just below the dried flower heads. Green Anole surveying its surroundings. Photo by Patrick Higgins. It made me recall as a child when every U.S. five-and-dime store sold green anoles as chameleons, along with baby red-eared turtles. Although our anoles can change color, chameleons they most certainly are not. Anoles are creatures of the new world and members of the Iguana family. They are very limited in their color palette compared to the rather prehistoric-looking true chameleons of Africa and the old world. These have feet with two toes facing forward and two back to better grip branches in common with parrots and woodpeckers, independently rotatable eyeballs, prehensile tails and famously, projectile tongues to seize their prey. Our native green anole (Anolis carolinensis) seems mundane in comparison. It is however, very versatile and a remarkable survivor in the face of collection for the pet trade, habit loss and invasion by its cousin, the Cuban or brown anole (Anolis sagrei), native of course to Cuba, as well as to the Bahamas and nearby islands. The natural distribution of green anoles is southeast United States from East Texas to North Carolina and the Florida peninsula. Ironically, they’ve been introduced and become invasive in Hawaii, Japan’s Ogasawara Islands and Guam, although in the latter, they in turn are now threatened by an introduced brown tree snake. There are also a few isolated introduced populations of greens in California. Even through greens can turn brown, browns and greens are easily differentiated by head shape; the green has a longer, more slender snout, rather analogous to the difference between crocodiles and alligators. The short-snouted browns exhibit a great deal of color or rather brown variation. Females often have very distinct dorsal striping and the heads of juveniles sometimes an orange tinge. Browns can change color from brown to black, but not to green. Both species have foldable throat fans called dewlaps which they use for courtship and territorial display. On the brown this is usually orange, rimmed or speckled with yellow as shown in photo. (Photo by Patrick Higgins). Here in Southwest Florida we have our own green subspecies, the southern green anole, Anolis carolinensis seminolus that has a pale cream-colored dewlap in contrast to reddish dewlap of the more common and widespread northern green anole, Anolis carolinensis carolinensis. Our anoles mainly feast on bugs and such, typically using a dash and seize technique that results in an appalling display of table manners as they chomp their prey with legs sticking out of the mouths in all directions. The introduced green iguana starts off as insectivorous but evolves into an herbivore as it matures much to the chagrin of Florida’s gardeners. Perhaps as a nod to their iguana relatives our greens occasionally lick nectar and eat pollen or even the odd flower petal. The brown anole probably arrived in the Keys in the 1880s. A century later it had colonized the whole peninsula south of Gainsville. Movement of landscaping materials during Florida’s population boom rapidly spread their range. Browns now extend into Louisiana, westward as far as Houston and into central Georgia. Further northward expansion is currently limited by winter temperatures. As new arrivals they are more cold sensitive than the greens, but natural selection may breed this out, or climate change make it less relevant. In areas where the they overlap, numbers of greens plummet as the two species compete for food and habitat. There is somewhat of a natural resource partitioning as browns are more terrestrial, favoring the ground and perhaps 3-5 feet above it, whereas the greens are distinctly more aboral favoring a higher zone with a slight overlap. Greens are creatures of the canopy. The rub is that both species have to come down to the ground to lay eggs, and browns are more prolific egg layers. I have greens in my suburban Naples yard because I have lots of vertical structure (trees) to create habit for them. Sadly, many Floridians favor a bare expanse of lawn with no room for greens. Many visitors mistakenly refer to both species as geckos. I usually instruct them to grab a flashlight and check the eaves of their house after dark and they’ll soon see the difference; geckos have big eyes suited to a nocturnal life, padded suction cup-like feet, a very flat posture and squiggly running motion. Most of Florida’s geckos are introduced exotics. However, one could argue they’re not really invasive as they fill an unoccupied niche in our lizard-scape, mainly competing for prey in urban areas with our invasive Cuban tree frogs. However, there’s a new threat, the knight anole (Anolis equestris) the largest of the anole family that grows up to 19 inches – another Cuban import that probably arrived in the 50s. When I first came to live in Florida in 2010, they were mostly confined to around Coral Gables’ Fairchild Botanic Garden, but within a few years I made the occasional sighting on the palms by Naples Pier and then one day I spotted something peculiar peering around the trunk of a Dahoon holly in my back yard. When I went out to investigate, it expertly played hide-and-seek as I walked around the tree, so that it was always tantalizingly on the opposite side. Finally, it made a dash for the canopy and I saw it was a huge green muscular lizard with very heavy jaws and a bright yellow flash on its shoulder. 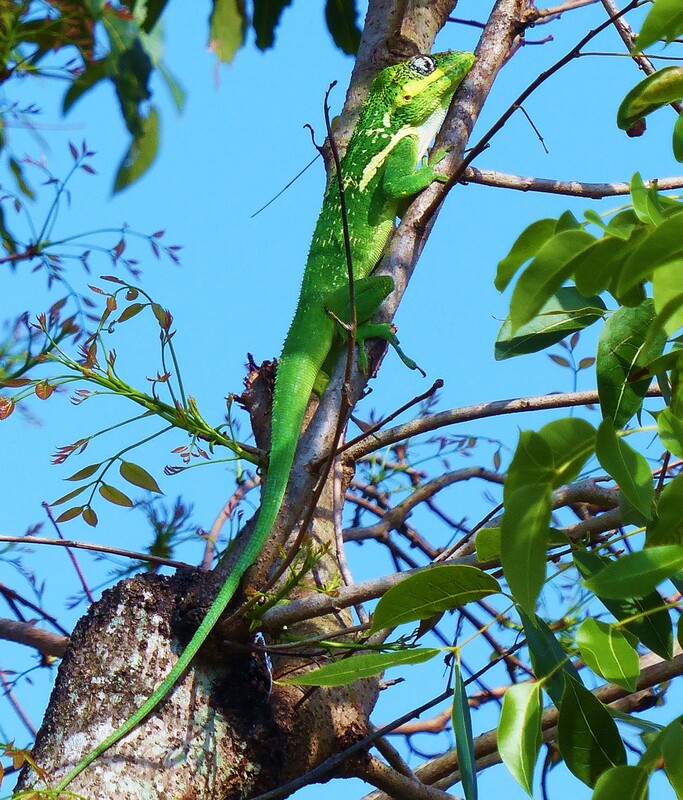 It was a knight anole, as shown on right (photo of Knight Anole climbing by Patrick Higgins). Since then they’ve been regular visitors and are clearly breeding as I see a variety of sizes. They seem to establish a territory and do a regular circuit scouring all the trees in the area for tree frogs, bird nests and other anoles. They are completely aboral and never appear on the ground except to dash from one trunk to another. Fortunately, their range is very temperature dependent – if it falls to around 400 F they go comatose and drop to the ground. But beware; if you warm and wake them, they can be quite ferocious, hissing and biting! 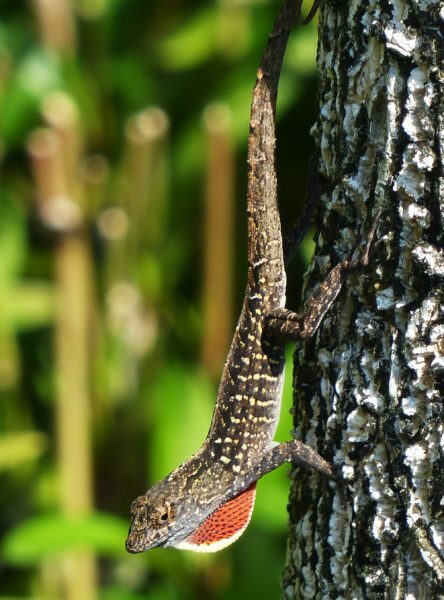 In escaping the predation of the knight anole, greens may have a slight advantage over the browns as they are more agile in treetops and better able to utilize slick leaf surfaces. 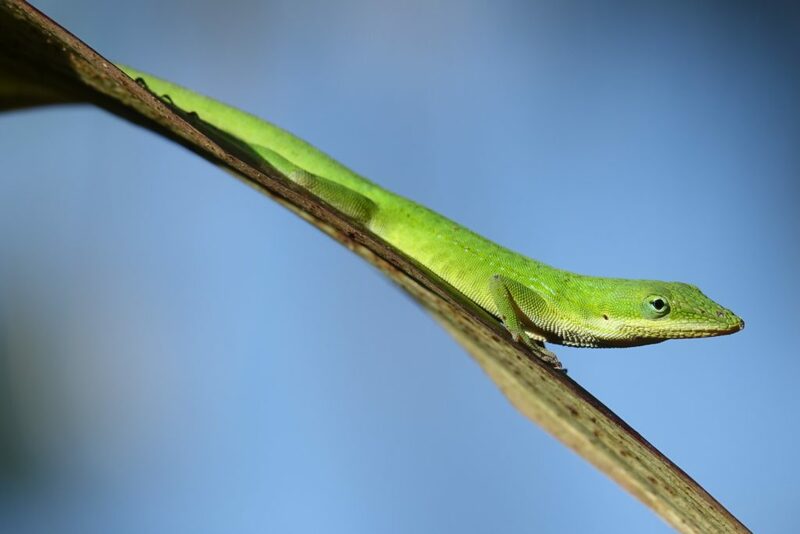 There has been some interesting work in evolutionary biology by Harvard’s Dr Jonathan Losos on this subject, utilizing anoles on isolated scrubby Bahamian islets that had either been swept bare of lizards by hurricanes or had them artificially removed. They first introduced brown anoles after painstaking recorded their limb dimensions, and then ground-dwelling curly-tail lizards that would predate upon them. The curly-tails forced the browns to move up in the bushes and clumsily use narrower vegetation to which they weren’t well adapted. Using other islets with no curly-tails as a control, Dr Losos and his colleagues were able to determine that within just a few generations the browns had evolved shorter limbs in an amazing example of rapid evolutionary change. And yes, they can shed their tails to distract predators and regenerate them, but it’s not without cost. There’s the energy required to do so and then the tail does perform a function. It provides rotational stability when jumping and aids in balance. The green anole on the goldenrod stalk decided I was watching him too intently and suddenly justified the expression ‘leaping lizards’ to disappear towards a nearby hardwood hammock, but it created an opportunity for a bit of instant interpretation and perhaps the inspiration for one of our group to create a bit of vertical structure and plant a tree in their backyard.